Property Size 200 sq. ft.
STARR'S SUITE has a state-of-the-art kitchen including granite counter tops, a Jenn-Air 2 burner cook top, dishwasher, under counter refrigerator/freezer, microwave, coffee maker, blender, toaster and soft mood lighting under and above the cabinets. There is also an ice-maker on site for fresh ice to prepare your tropical drinks. It is equipped with everything your gourmet heart could desire to prepare your fresh catch of the day or simply heat leftovers from our fabulous restaurants, at least 22 within a several block radius. Included is coffee, sugar and cream, foil, wrap, zip-lock bags and dishwashing soap for your convenience. The inside dining table with bar stools is custom made from a Sapodilla tree that once stood on the site of McCartney’s Manor. Also included is a Bose Bluetooth speaker, Amazon Alexa Dot, 50” Smart TV and DVD player. The bathroom vanity has a granite top with a stainless steel sink. The stylish shower is tumbled marble for your enjoyment. Of course, Tommy Bahama soap, shampoo, conditioner and body lotion, hairdryer and pool towels are provided as an amenity. 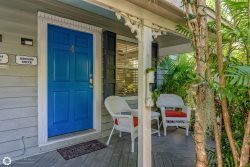 Your private, gated courtyard has a porch over the out-door dining table and chairs for enjoying your morning coffee or your evening cocktails! It also includes a top-of-the-line Solana 2 person hot tub with back and foot massagers to delight your senses after a busy day of exploring our wonderful little town. The common area has a bike rack, Weber gas BBQ grill and a washer/dryer for your use. Upstairs, on the deck overlooking lushly landscaped Abbey Road, you can enjoy yourselves at the common area outdoor table and chairs for up to 6 persons…invite guests from Harrison’s Hideaway, Starr’s Suite or Lennon’s Lodge to join you for drinks and conversation under the towering Spanish Lime trees…or to star gaze on a warm tropical evening. There is also an ice-maker there. Take your computer there to do some work, if you must, with our free wi-fi. Next door is one of our 2 heated pools for working on that perfect Key West tan! Call us today to reserve this special, much requested cottage! Parking: Street Parking Only but we will reserve a spot for your arrival. Restrictions: Smoking permitted outside only. Location: 1/2 block from Duval and Truman Street on a quiet lane. Great place to vacation in Key West Our stay here was amazing. The location was right off of the main street with all of the restaurants and bars and just a short driving distance away from the beach. Room was a good size and the bed was extremely comfortable. Would definitely recommend this location and try and stay here if we ever come back to Key West.